Product #45684 | SKU DRDP3LDNRK | 0.0 (no ratings yet) Thanks for your rating! 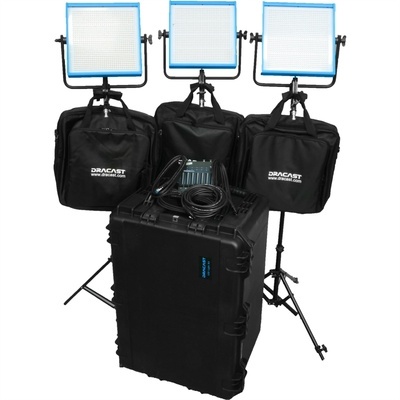 The Newsroom Daylight 3-Light Kit features three LED1000 Plus Daylight LED Lights with DMX along with three standard DMX cables, a 20' DMX cable, three junior pipes, and an Elation Professional SDC12 12-Channel Basic DMX Controller. This allows users to set up and remotely conrol their lights easily and efficiently. Three light stands are also included for convenience along with an SKB carrying case for storage and transport.